On one of the most important weekends of the clubs history, the long awaited development draw was held on Sunday night in a packed Community hall. Parish priest Fr Cremin was the man tasked with pulling the winning tickets. With tickets sold all over the county, the prize winners reflected this with a wide spread of winning tickets. The first prize of €20,000 went to Brian Hayes, Coosheen Schull. Ex cork senior hurling manager Denis Walsh Ballynoe won the second prize of €5,000. The club would like to thank everyone who bought tickets and congratulate the winners. €185,000 was collected in total which was a phenomenal amount considering the economic climate, and for this the club is truly grateful for the generosity of the people throughout the county and further afield who bought tickets. With these funds and the sports capital grant secured earlier in the year, work will begin on the new development in early 2015. Best of luck to everyone who bought a ticket for the draw. The draw will take place in the community hall at 8pm (today Sunday 26th October) Refreshments will be served. All are welcome.. Ticket sellers are currently out and about West Cork and the County. The Sports capital Grants were announced recently. Kilbrittain GAA club were granted €120,000 towards the new development. This is a huge boost to the whole project. The club wish to thank all who helped in the preparation of the Grant Application back in February. Thanks to anyone who donated, loaned, took out multi membership or took out annual lotto subscriptions. It all helped with the application for as much funding as possible. €120,000 surpasses what we were hoping to get. A huge thanks to Raymond O'Leary for his expertise with the application. 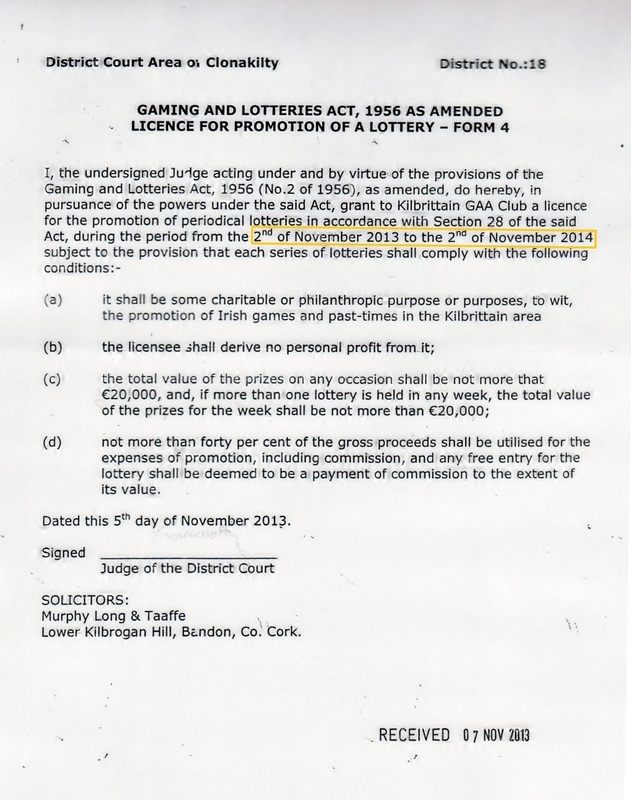 The extension to the draw permit has been granted at Clonakilty Court. This ensures we can continue to sell tickets for the next few months in order to cover all of West Cork and more of the County. Due to the time consuming nature of covering as much area as possible with ticket sales, and with such a large area of ground to cover, the draw date has been postponed to ensure enough money can be collected to make the venture worthwhile. The club have obtained permission from an Garda Siochana (issuers of the permit) for an extension to the permit and so the draw will be held in 2014 at a date yet to be decided. The club are currently out selling Dvelopment Draw tickets. Anyone who can help are asked to contact club officers as the more people we have out selling tickets, the easier the job will be for everyone, also the more area we can cover. Please if you have a couple of hours to spare during the week, contact club officers who will organise groups of people to cover an area. It is not a hard job once you get out. The response at the doorstep is favourable. Thanks to everyone who have been selling and continue to sell tickets. But we need more bodies. Kilbrittain GAA club recently launched their development fundraising draw. 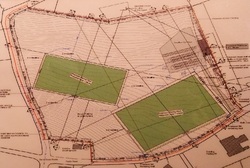 The club has undertaken the difficult job of raising funds for the proposed development of the land purchased by the club in 2008. With ever increasing playing numbers at Under-Age and Adult Level and a very active Camogie Club, the provision of extra facilities will provide future generations with ample playing facilities for all to enjoy. The proposed development which has attained full planning permission, will consist of two full sized playing pitches along with dressing rooms/meeting rooms and ball alley. This development is in an excellent location, very close to the village and will be a major addition to the overall welfare of Kilbrittain GAA club. To fund the development of the field, the club has decided to run a draw for a prize fund of €40,000. The top prize will be €20,000 with second prize of €5,000 and fifteen consolation prizes of €1,000. The draw was recently launched at the community centre dressing rooms in the presence of Brendan O’Driscoll, coaching officer of the County Board, Aidan O’Rourke, Development Officer of the West Cork Board, Denis Ryan chairman Kilbrittain community centre, Kieran Butler Kilbrittain Lord Mayor, club president Frank O’Brien, club officers, under-age officers, camoige club representatives, draw committee members and senior club players. "this is going to take a huge afford from all club members. We have ten teams out selling tickets at the moment this has to increase if we are to achieve our targets." he added "The response on the door steps is excellent and we are very grateful for the support received thus far." Tickets for the draw are priced at €20 and Ticket sellers will be travelling far and wide throughout the county. Proposed development shows position of the two pitches with the main pitch nearer the road and main entrance. (Opposite the present 'Kentree' factory site, bottom right hand corner). Dressing rooms and car parking area are seen to the right o the site overlooking the main pitch.